Patients are always happy to save their natural teeth. Even many teeth with significant defects resulting from External Cervical Invasive Resorption (ECIR) can be predictably saved. 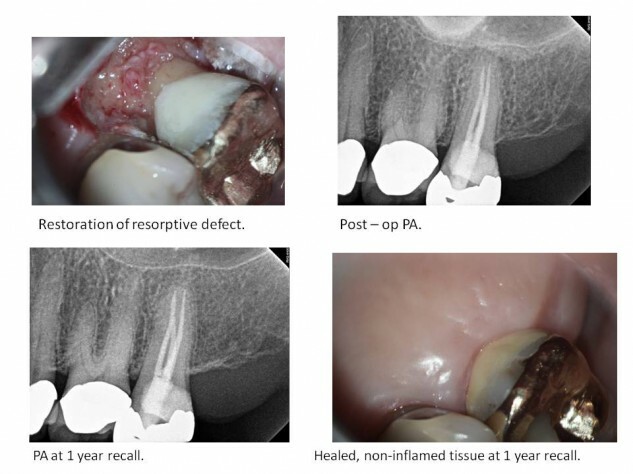 ECIR is a non-inflammatory resorptive process that can occur when clastic cells have access to dentin following damage to the cementum / PDL protective layers of the root. After clastic cells remove dentin, PDL-like tissues invade the tooth. These lesions may become large because incipient lesions are difficult to detect, owing to the fact that they initiate within the periodontium, so are sub-gingival. The process is not related to the pulp of the tooth. 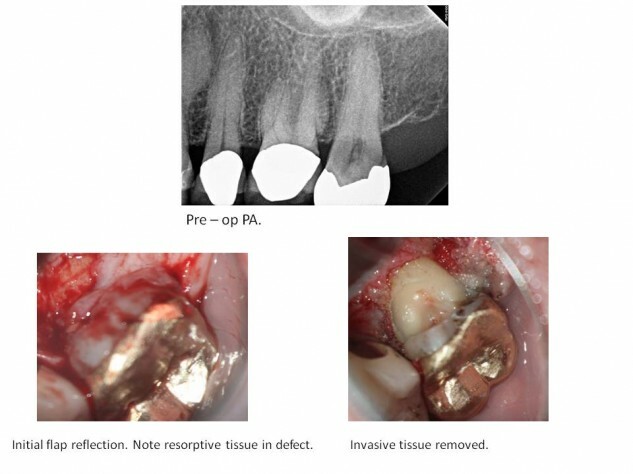 Many cases are detected once the resorption reaches the pulp however, when the pulp becomes subsequently infected with oral microorganisms through the resorptive defect. At that point, patients will experience the typical symptoms of irreversible pulpitis. The case below is an example of an extensive ECIR defect on the palatal of # 15. The patient’s chief complaint was lingering sensitivity to cold. A surgical approach from the palatal was used to debride and restore the area of resorption. Root Canal Therapy was completed because the pulp had become secondarily infected. When the patient returned for her one year recall, she reported that her tooth and gums were completely asymptomatic and functional, and she expressed her appreciation to be able to save her natural tooth.